Before going to Nantes, I knew a lot about the local history - the edict of Nantes confirming the unification of Brittany with France, for instance, and a little bit more about the Loire Castles - but did not have a clear idea about the present of the city, its people and what to expect in terms of cuisine. After spending there one days and a half I left with the feeling that I would loved to stay more, not because it is France, but because everything has an inviting special flavour. And it is not only because they have delicious galettes, believe me. I arrived in Nantes in a rainy afternoon, keen to find my hotel. But as it seems it was not easy and the hotel was not situated in the central area, I preferred to spend an hour walking the streets of the old city. I ended up in Creperie Heb-Ken that was packed with people, many of them tourists brought there by rain and posh recommendations. The crepes with apple were more delicious than the my first galette - with mushrooms. I was not very impressed by the taste as such, but appreciated the very fast service. I left in less than one hour, convinced that I should return for a proper review but even though I will pass by several times in the next 24 hours, I was too busy to review and visit new food places. However, it was a very good start to get acquainted with the people and the local food. Once I was able to locate my accommodation, early in the morning the next day, I started my real Nantes adventure. Cultural and intellectual adventures, of course, as the city is not that big to get lost and safe enough to do not have problems at all - I went in some 'banlieu' but was nothing compared to what you can find in Paris or other big cities. First stop before going on the tram was at a small bakery - boulangerie. Besides their important role in bringing good smells and tastes to the local tables, such places are real social connectors labs. I stayed there for around 5 minutes and observed how the ladies serving there were asking the customers about their children, relatives and the latest holiday plans. They sold me a Bottereau with a smile and invited me to come tomorrow too. Most probably, they were curious about me. If you don't have a good budget for taxi trips or if are not a car traveler, using Nantes public tram system is the best way to move around. It is cheap, goes very fast and looks very clean - much cleaner and elegant compared to the Paris subway. The bus service is also available, but I was so happy with the tram connections that I did not want to try anything else. With the tram, I tried to go on and off several times, attracted either by a colourful graffiti, or an old building or something appealing for my photo guides. My big next stop, after a little foodie adventure tasting some tartellette citron with a coffee, was in Jardin des Plantes. If you are commuting by train in Nantes or if you have some free time before going to your next destination, you should spend here at least 10 minutes. It is situated close to the train station and many passengers prefer to stay there and relax with their luggage for a couple of minutes or hours. As for me, I stayed there for at least 2 hours and still not having enough of admiring the beautiful flowers and the creative green areas. As during this summer, several art installations were created in the city, part of the Voyage à Nantes project, the garden was offering a lot of surprises to the visitors: the laughing stones, the huge resting grass duck or the gigantic bank. With my lungs full of fresh air, I continued my journey with some historical discoveries: a visit at the Castle of the Ducs de Bretagne. 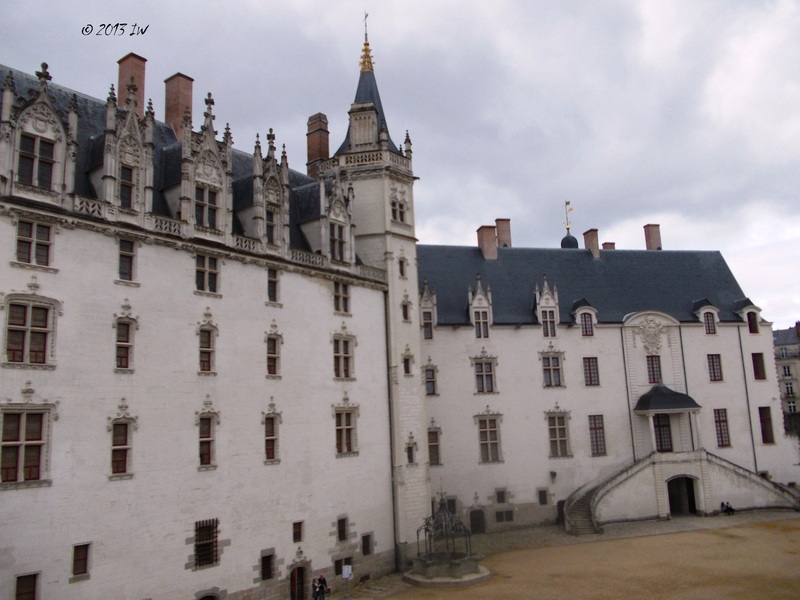 The building constructions were started in the 15 century by the Francis II, the last duke of Brittany, and continued by Ann, his daughter. In 1784, Louis XV transformed the castle into an arsenal aimed to defend the Atlantic Coast. Nowadays, it hosts a permanent historical exhibition and several spaces dedicated to temporary exhibitions. I went to the one dedicated to the world wars, made a tour of the ramparts - with a lot of facilities for disabled persons and trolleys - and continued with the discovery of the past of Nantes at the dedicated history museum. Even though I pretend to know more than the average about European history, especially history of France, there it is always something new and interesting to learn. I did not have any idea before that the delicate 'petit beurre' are a local trademark, created till the late 1990s at the LU biscuit factory. The former factory left with only one tower out of 2, is nowadays hosting a lot of cultural events. Apparently, this is the fate of the old industry here - as in Berlin sometimes. The Manufacture, formerly a cigarettes factory, is fulfilling the same function today. After so much history, I wanted to walk more around and spent the next hour going up and down in the old city. My next destination was more modern and creative: the Jules Verne Museum. I was not such a big fan of Jules Verne - I've read some of the books but the only one I keep reading over and over again was the 80 Days Round the World. The museum offers a small overview of the works and life of the author, plus some samples of the books edited by different edition houses. A bit disappointed, I wandered a bit around the area - an Astronomic Observatory is in the neighbourhood, and went straight forward to the Island of Nantes. There are many nice islands in and around Nantes, but nothing compares to the island of Nantes. It looks like a little artificial paradise - but not in the Baudelaire's sense. It is a world of imagination, with many machines that reminded me all the time about the courageous human mind. Too wise to go in a marry-go-round with marine animals and fish without scarring the children, I booked a trip with the mechanical elephant. To be honest, it was better than during my Chiang Mai trip - except maybe the noise. 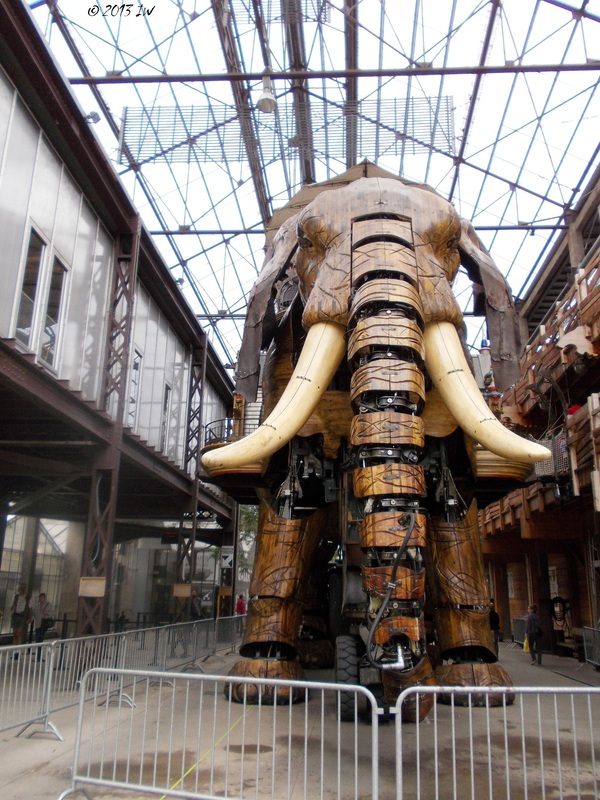 The huge wooden and metal machine is moving slowly, as a careful pachyderm, enough to make you feel that you are in a different world that we cannot always describe properly using our adult knowledge. The best is to not try to make too much philosophy and enjoy the moment. It is what I've done and prolonged my experience with a longer visit at the exhibition of machines. After so much walking without eating anything else than food for thought, I felt that it is about time to go back in the city and try to find some place to eat. But it was a kind of underestimation of the local offers and two hours after, around 6pm, I was still hungry but too busy to take pictures of food shops or to talk with shop keepers about their products. Hard to resist the welcoming French and I was too curious to discover more and more about macaroons, baguettes, cheeses and various types of wines. I did not miss some bookstores though, as I usually do in France, exploring the latest titles. The North African literature is always well represented and I am very happy to get in touch with a cultural and literary universe not always accessible in other parts of the world. As there was the sales season, the shopping marathons were open, with amazing offers. But in France, shopping is an art, and the local branch of the famous Galleries Lafayette offers to the visitors interesting window concepts through art installations. The shopping exploration continued the next day, with some long investigations of the latest news in terms of kitchen tools. Another good destination for special shopping addicts is Passage Pommeray, with classical statues guarding the coming and going of the busy visitors. Shopping can be an aesthetic experience too. After I saw a lot of interesting and tempting small and big restaurants - the classical Thai, Japanese and Indian, but also some special Cambodian menus - I took one hour break and tasted some Galette Provencale and Crepe Broceliande at St. Leonard. Eating outside in the summer is recommended, otherwise it is possible to find a place inside. The service was a bit slow, but worth waiting. The main advantage of the summer trips is that even after 8pm you still have enough light time to continue the journey for at least 2 hours. It is what I did, walking slowly the streets, observing the simple architecture - sometimes with some Alsacian influences - and the green trees. 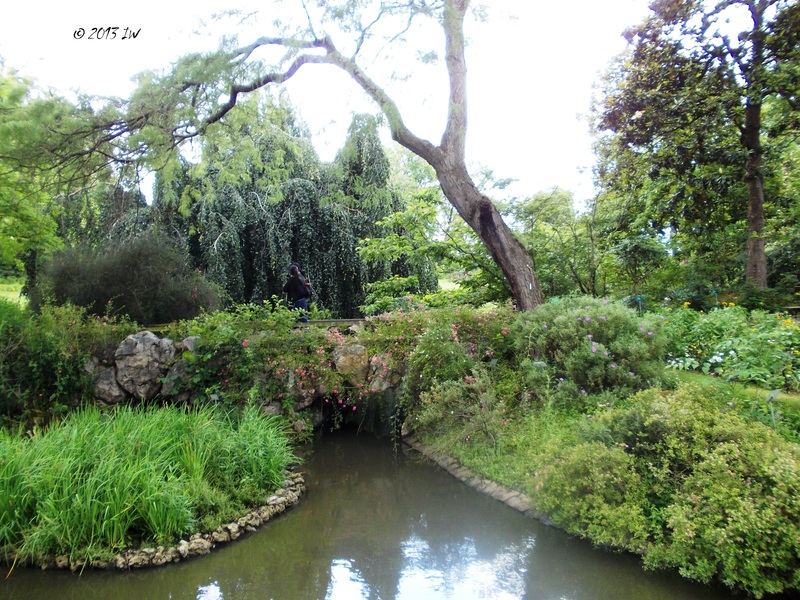 Nantes is a city of parks par excellence, and the designation as the Green Capital of Europe for this year is fully justified. There are a lot of parks, not only used for playgrounds - the city is a paradise for children too, and the food is not the single reason for that - but as places to rest, recharge the batteries and contemplate the nature. Equally, the city authorities are preoccupied with healthy food and healthy life. Thinking about the challenges of the modern cities, I arrived in Island Feydeau, bordered by the Erde, with many restaurants and places where the youngsters are hanging out and even a boat hotel. The fresh ambiance was the only thing I needed for ending such an intense day. I returned in the area the next day, for taking some pictures of the monuments in the memory of the French victims of the wars and the Resistance heroes. As usually, after a first full day, the next stay is rather dedicated to put together all the details of the trip and to try to go beyond the tourist understanding of the city. After a long breakfast - a croissant and a small coffee - and some more writing, I went to the Talensac market, strongly recommended by other visitors of Nantes or some online tourist guides. I was waiting more action and interesting people around, but maybe it was only Wednesday. I felt like I am in a big supermarket missing the real life feeling from the big markets of my childhood. However, the products were great and tempting and with many local offers, such as the beautiful Senegalese mangoes or the Moroccan specialities, as well as the tasty looking home-made pasta. Nothing to say about the chesses, as it was exactly what I usually expect from a French market. After more walking and another small stop in Jardin des Plantes - with more kids running around in the maze of trees and flowers, I went to my TGV, heading to my dear Paris. I felt completely uplifted, ready for new culinary experiences and with a completely new understanding of France. This country means something else in each department and was happy to be part for a short while of the Brittany experience. Promise to be back soon, Bretagne!